Take a sheet of plain white card stock, stamp it in Versamark Ink with your images. Then, take clear embossing powder and heat emboss the entire piece. Next sponge various colors over your entire piece of card stock. That highlights your stamped images beautifully. You can stop there if you wish but I took it one step further by using the same images and inks, and stamping the card stock again. 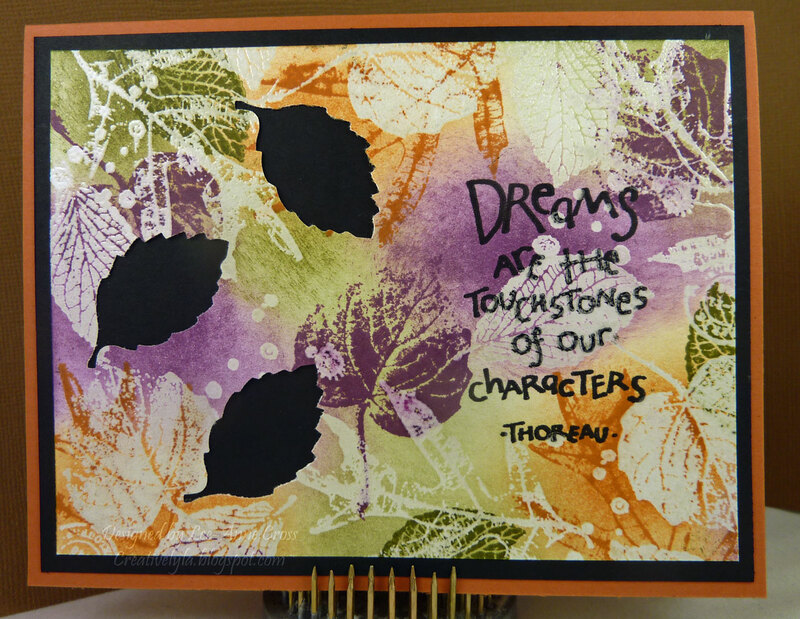 And finally, I stamped the sentiment over top of the page and used a leaf punch to show the black card stock through the embossed resist piece. This is so beautiful! Thanks for the instructions. Beautiful fall creation! Fabulous colors! What a beautiful card! Love the colors and leaves, etc. I am signing up to become a follower. Have a great weekend! Next Next post: Do You Know This Stamper?